Written by Jess Shankleman. This article first appeared in Bloomberg Markets. 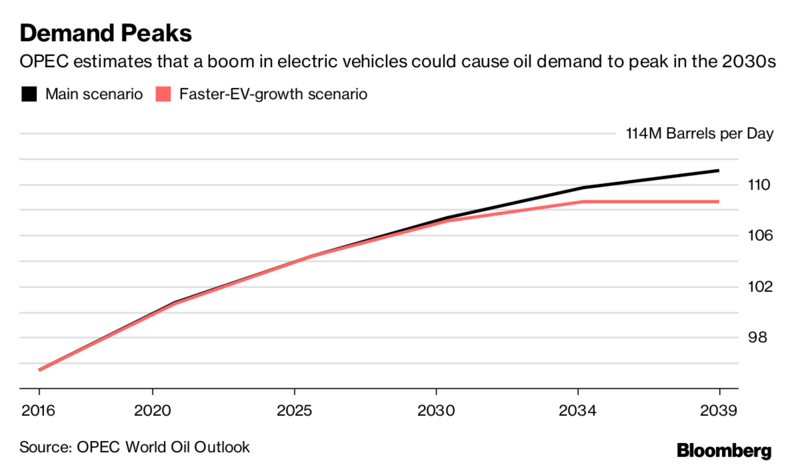 A larger-than-expected boom in electric vehicle sales could cause global oil demand to peak and flatten out in the late 2030s, OPEC said. If a quarter of the world’s cars have batteries, global oil demand would reach a plateau of about 109 million barrels a day during the second half of the 2030s, the Organization of Petroleum Exporting Countries said in its annual World Oil Outlook. The group’s main forecast is still for consumption to increase for decades to come as the electric car fleet expands at half that pace. Yet the inclusion of the faster-growth scenario shows they are starting to take the threat more seriously. After France, the U.K. and potentially China announced plans to ban the sale of fossil-fuel burning cars in the coming decades, oil producers are paying increasing attention to the impact on long-term growth in oil demand. So far, there is little agreement over the scale of the threat. The International Energy Agency sees about 8 percent of the global light vehicle fleet running on batteries by 2040 with little impact on oil use, while Bloomberg New Energy Finance forecasts that a third of cars on the road will be electric. OPEC’s report also raised the possibility that mass adoption of car-sharing services such as those offered by Uber Technologies Inc. could eat away at oil demand as private car ownership falls. In China, rapid growth of sharing services could shrink the car fleet and cause oil demand from cars to peak in 2035 and then fall marginally over the next five years. That would mean oil use from the car fleet would be 11 percent lower than OPEC’s base case, which sees more modest growth in sharing and no peak in Chinese demand. In developed countries on the American continent, wide adoption of car sharing and ride-hailing technology would accelerate the decline in oil demand, resulting in a 7 percent drop to 6.3 million barrels a day by 2040, according to the report.